Maine has the greatest variety of cross country skiing centers of any state east of the Mississippi-from the northern Canadian border to the south coast and from the western mountains to Downeast. There are 21 commercial Nordic centers with groomed trails and skier amenities as well as miles of trails at state parks and nature preserves, Acadia National Park, and the White Mountain National Forest. For the entry level to intermediate skier, there are miles of groomed trails on summer farms turned winter Nordic centers. Harris Farm, an award winning dairy farm in Dayton, just west of Biddeford, has 40 Kilometers of groomed trails in their meadows. Five Fields Farm in Bridgton offers a 27 K trail network through apple orchards. Carters Farm Cross Country Centers have two locations- Oxford with 30K of groomed trails winding through cornfields and 55K in Bethel with beginner to expert trails traversing the family dairy farm and mountainside tree farm. Carter’s XC Ski Shop in Oxford has one of the largest selections of equipment and gear in all of New England. Pineland Farms in New Gloucester, just north of Portland, has 2500 acres of pastoral farmland with 25K of groomed cross country ski and snowshoe trails. Ski centers for intermediate skiers include The Bethel Inn Nordic Center with 30K of classic and skate tracked trails set on the gently rolling golf course. 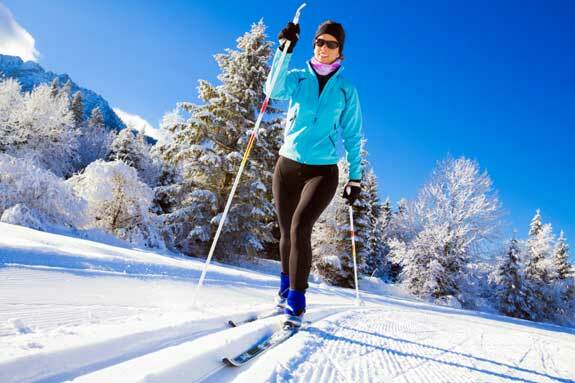 The Bethel Inn Nordic Center offers ski and snowshoe rentals and lessons. Beech Hill in Wayne, west of Augusta, has 11 K of terrain through the forests and always a complimentary cup of hot cocoa or tea for the active skier. For skiers who enjoy both Alpine and Nordic skiing, most downhill areas have Nordic centers too. Black Mountain in Rumford has 35 K and is well known for hosting collegiate and national xc ski competitions and even has snowmaking on 4 K. The Rangeley Lakes Trails Center on Saddleback Mountain Road has 35 K of groomed trails as well as 45 K of snowshoeing trails and a 4.5K dog friendly loop. Sugarloaf Outdoor Center boasts a network of 90 K of groomed trails for all abilities as well as an NHL sized ice skating rink. Sunday River’s Outdoor Center grooms 40 K with a scenic trail to the Artist’s covered bridge. Local ski areas in Auburn, Jay and Farmington also have groomed trails. For the back-country enthusiast, Maine has a network of trails like no other in New England. The Appalachian Mountain Club operates three Wilderness Lodges outside of Greenville-Gorman’s Chairback Lodge, Little Lyford Lodge and Medalwisla Lodge. The AMC maintains 70 miles of lodge to lodge trails. The Maine Huts & Trails network grooms 45 miles of trails from Carrabassett to West Forks. Three eco-lodges provide points of destination along the route and provide hearty meals and overnight accommodations. A cross between a resort center and wilderness skiing can be found at The Birches in Rockwood on Moosehead Lake. Located on an 11,000 acre, private nature preserve, The Birches grooms 40 miles of trails. You can stay at the comfortable lakeside lodge or opt for a wilderness yurt. Up north in Maine there is the 10th Mountain Center in Fort Kent, just across the border with Canada. The Center has a 30 K biathlon center which has been the site for National and World Cup Biathlon Championships. All across the state municipal and state parks, local land trusts and nature preserves are open to the public. Local organizations provide grooming and most are open free of charge. A list of Nordic Centers can be found at www.skimaine.com or search the etravelmaine.com ski directory. 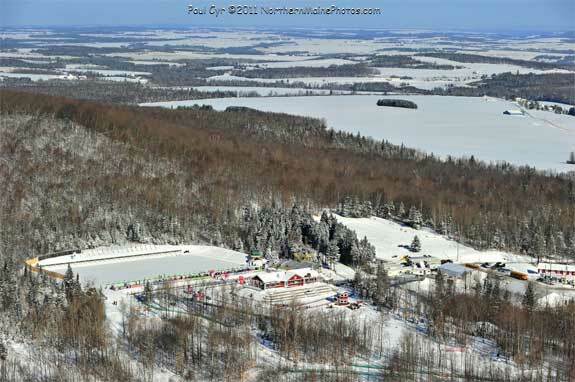 The 10th Mountain Center in Fort Kent features a a 30K biathlon center.